Samsung Galaxy Note 9 review | What Hi-Fi? 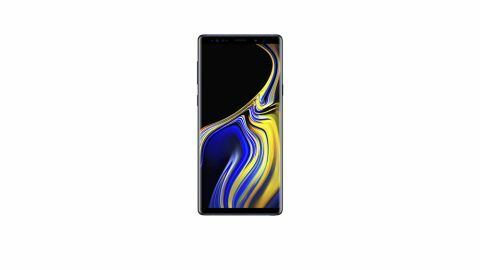 Samsung has gone big with the new Galaxy Note 9: bigger screen, bigger storage and bigger battery. Though the Note borrows heavily from the excellent Galaxy S9+ smartphone, it improves the experience by adding perks of its own beyond just size. The Note 9 is also Samsung’s priciest Note yet, but is it worth it? The most obvious change is the screen size, now a mammoth 6.4 inches. But Samsung has managed to cleverly pack in the bigger edge-to-edge screen without oversizing the physical handset – it is actually half a millimetre shorter than the previous Note 8, and only about 3mm bigger than the Galaxy S9+ in every dimension. Along with a slim profile and fairly narrow width (thanks to its 18:5:9 aspect ratio), this means the Note 9 doesn't feel oversized in our hand. As with any big phone you will need two hands to use it properly, and those with petite hands may struggle, but if you’re used to 6in screens, you'll find the Note 9 easy to get along with. It feels sturdy, too. The Note 9 uses Gorilla Glass at the front and back, with the aluminium frame on the sides blending in seamlessly to give it a premium feel. The phone comes in three finishes: our review sample’s ocean blue, midnight black or lavender purple. Sadly, a fourth finish, metallic copper, won’t be available in the UK. Elsewhere, Samsung has moved the fingerprint sensor to just below the lens. Previously placed right next to the rear camera in the Note 8, this is a more sensible and natural location, and means you won’t smudge the lens with mucky fingers every time you unlock your phone. The only irritating note is the side button dedicated to summoning Bixby, Samsung’s fledgling voice assistant. Situated below the volume rocker, we keep accidentally pressing it, which gets very annoying very quickly. With much of the Note 9 taken up by its 6.4in screen, it’s a good thing it puts on an impressive show. Samsung has stuck with what it knows works best: a 2960 x 1440 resolution (same as the Note 8 and S9+) on a super AMOLED panel that delivers sharp and punchy colours. Blacks are inky deep on the Note 9, and colours pop with boldness and exuberance. Games look lush and 4K HDR videos (the Note 9 supports standard HDR10 playback on YouTube, Netflix and Amazon Prime Video) are stunning. The Note 9 defaults to a FHD+ (Full High Definition, 2220 x 1080) resolution, but the WQHD+ (Wide Quad High Definition) resolution gives you that extra bit of sparkle and insight when watching Netflix videos. In comparison, Apple’s iPhone X and 8 Plus offer a touch more nuance in textures and shading, giving videos a more natural colour balance and realistic depth. The whites are a bit more pristine, too, but we like the crispness displayed on a Note 9. Unlike Apple, however, Samsung lets you adjust the sharpness and colour balance of your screen to your liking. There are also four different screen modes – from the vivid, hyper-punchy ‘Adaptive Display’ to a more neutral ‘Basic’ – that are worth experimenting with. The Note 9 is silky smooth in use, with every swipe and button-press reacting instantly. The phone is powered by the Exynos 9810 Octa-core processor – again, the same one used in the S9+ – so it’s no surprise it’s a speedy, powerful performer at all times. The phone comes with Android 8.1 (Oreo) installed, and it’s a clean, clutter-free and blissfully bloatware-free interface. Samsung is taking advantage of its acquisition of Harman and its associated audio brands, so like the S9+ and Tab 4, the Note 9’s external stereo speakers are tuned by AKG. They are rather treble-heavy with little bass to round off the sound, but it’s fine for watching a short clip. AKG in-ear headphones are also bundled in with the Note 9, along with a choice of ear tip sizes. They are a step up from the usual no-brand earphones – clear and punchy, with only a touch of sibilance in the crisply etched midrange – but if you’re listening to hi-res music (the Note 9 supports up to 32-bit/384kHz sampling rates), we’d recommend better headphones, such as the AKG Y50s or Sennheiser Momentum over-ears. We play 24-bit tunes from Tom Waits, Nils Frahm and Hans Zimmer, and the Note 9’s full-bodied, spacious and detailed sound makes for a comfortable, pleasant listen. It can’t quite match the level of precision and dynamic subtlety offered by Apple iPhones, which are more expressive and articulate. But the Note 9 is controlled and confident, lending decent heft to Spotify streams. Unlike some of its rivals, Samsung has continued to fit a 3.5mm audio jack, so you can use your favourite pair of headphones without needing a silly adapter. Dolby Atmos - what is it? How can you get it? One of the biggest draws for Note fans, the trusty S-Pen stylus now has Bluetooth. That means you can use it as a remote control, click the side button to take a selfie, launch apps and pause and play YouTube videos. It opens the camera app by default, but the functions for each click, double click or long press can all be customised. Bluetooth integration means there’s a tiny battery in the S-Pen, which lasts for 30 minutes. However, you only need to slot it back into the Note 9 for 30 seconds to get it up to full charge. You can of course still scribble on the Note 9’s screen as always, even when the S-Pen is out of charge. The new S-Pen’s increased responsiveness means it feels as organic as writing with a good ink pen. It may seem like a gimmick to some, but it could just tip the balance towards the Note 9 over other Samsung phones. The Note 9 sports the same dual pixel camera as the S9+ – two 12MP lenses (one wide angle, one telephoto) with 2x optical zoom and optical image stabilization – and there’s also a decent 8MP front camera. The main snapper shoots 4K videos and 30fps. Photos in natural light are crisp, focused and vibrant, while low-light snaps have plenty of detail and little noise. Colours are on the punchy side of neutral, though still impressive with it. The Note 9’s camera is upgraded over that fitted to the S9+, with intelligent software that automatically picks the right settings according to your surroundings or subject matter, and even alerts you if the photo you just snapped was too blurry or someone had their eyes shut. You can turn off this ‘scene optimiser’ feature, but we found it gave more impressive results when switched on. The Note 9’s size proves its worth with its whopping 4000mAh battery. That’s 21 per cent up from the Note 8’s 3500mAh, and considerably larger than Apple iPhone X’s 2716mAh. Samsung’s claim that the Note 9 will last an entire day on a charge proves accurate, as a typical day of listening to music, browsing social media and playing games doesn’t have our Note 9 on low battery life by nightfall. In fact, we only charge the Note 9 every other day. It charges quickly, too, thanks to its USB-C port and charging cable. Adapters for USB-A and microUSB also generously included too. The other big talking point is a maximum of a huge 1TB of storage if you opt for the 512GB model (our review sample is 128GB). That’s large enough by most smartphone standards, but you can expand it even further thanks to the Note 9’s microSD slot that supports up to 512GB of media. For anyone wanting a sizeable library of downloaded movie files and hi-res albums, the Note 9 makes a great portable hard drive. Imagine never having to delete a photo or app ever again. But all this tech doesn’t come cheap. The Note 9 is Samsung's most expensive phone yet: the 512GB version will set you back an eye-watering £1099. That's £50 cheaper than the 256GB Apple iPhone X, but still a lot of money for a smartphone, especially when its screen, camera and audio haven’t had any significant updates over the Galaxy S9+. That doesn’t take away from the fact that the Samsung Galaxy Note 9 is a really enjoyable, cutting-edge device. For those wanting a big phone (and all its extras) the Note 9 is easily the best Note that Samsung has produced, and that makes it one of the best Android smartphones around.